Finding difficulty in hitting high notes? Possibly you are one among many singers trying to learn how to increase your vocal range so that you may finally sing all those beautiful songs you wished to sing. 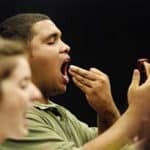 For this you have to improve the strength of your vocal chords by doing exercises and following proper techniques of singing. One of the best methods to find and increase your vocal range called “speech level singing techniques”. This singing technique utilizes specific exercises focus on training your particular muscles next to your vocal cords. These muscles are “inner muscles of the larynx” … It’s purpose is to develop your larger vocal range and to establish a more consistent tone from your lowest note to your highest. Articulation and production of sounds and words in the form of music or in a specific tune is called singing. An artiste who sings is called a singer or a vocalist. Songs can be sung in two ways. As a Cappella, that is singing without accompaniment and Orchestra and that is singing accompanied by other musical instruments. In the vocal singing, this can range from a single instrument accompanist like a piano, or an entire orchestra; and the singers can be single, duet or group/band or choral. Almost everyone who can speak can sing, since singing is only a form of sustained speech, which comes out in the form of a tune. Singing is very often done with a group of other musicians, such as in a choir with different voice ranges such as tenor, soprano, alto and bass. The first step towards improvement is to find out the reasons for not being able to hit high notes. One reason is that you are possibly singing in your falsetto voice. This happens when your chest voice has reached its maximum capacity and your vocal chords get separated, your tone loses depth and you sing in a falsetto voice which is thin and high and a little artificial. Falsetto voice can be used at times for certain notes. However even the transition from normal voice to falsetto has to be so smooth as not to catch too much attention. At all other times even the high notes should be sung in a normal voice which has fullness and depth to it. Another reason for trouble in hitting high notes is that you could be pushing your chords to sing beyond its capacity without fully developing your vocal chords. When this happens you try to yell out the high notes thinking that volume will make up for hitting the high notes. This will will not only be jarring to the ears of the audience, it will also surely damage your vocal chords. Hence you have to correct both these singing methods by learning how to increase your vocal range with speech level singing exercises. 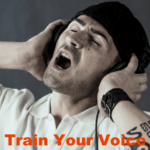 These exercises will help you to develop your mixed voice which is a blend of chest voice and head voice and allow you to hit high notes without straining your vocal chords. Your normal singing voice in which your are fairly comfortable is called your “chest voice”. At this point your vocal chords are open at maximum length and vibrating fully. But as you start singing higher notes the chords become shorter and the vibrations are less intense and at a higher frequency. Hence as your voice peaks, the vocal chords close up and there is a transition from chest voice to head voice also known as the falsetto voice. Now, what a singer needs to understand is that it is easy to sing in either head voice or chest voice. But to sing in the mixed voice at the transition point without breaking is a skill to be practiced. And It is singing at this gray area that your voice is at risk of damage unless you use the proper techniques so that your voice does not crack and give up. You need to practice singing in the mixed voice whenever you are at a practice session so that the transition is smooth and the blending of chest voice and head voice happens without cracking. If at any time you feel your voice is breaking, let up and give your vocal chords a rest. Never ever strain your chords. Below is the video explaining the relations of your vocal range and what your voice will sounded like if you are singing in different chest, head and mixed voices. The exercises are in some ways, very advanced. They typically involve only specific muscles of singing to enable you develop a more efficient and better voice. 1. Practice singing everyday and if this is tough, then at least five day a week. Early morning practice is generally suggested to open up your voice thoroughly. 2. Do a warm up session for a few minutes before you start singing. Stretch your vocal chords by singing “aah” “mah” “doh” “mee” and such sounds in the three different registers, low, medium and high. Hold the sound in each scale as long as you can. 3. Select a song, which falls in the highest register, which you can manage and practice it two or three times. Sing in a relaxed manner, take long and deep breaths and hit all the top notes correctly. After a few days you will be able to do this easily without stretching your vocal chords. 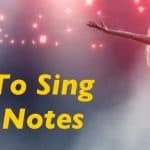 Then you should choose a song with a higher scale in order to practice your vocal singing techniques. 4. Similarly choose a song which has a low register which you can just barely sing. Sing it two or three times everyday till you become comfortable singing the song and you are able to reach the low notes and it is audible. After that choose another song with a lower scale to practice with. Step 1: The first step is taking a deep inhale through your nose, and singing a relaxing high note with the use of vowel “ah” or “Uh“. Then, start sliding down trying to imagine that you’re playing a small whistle or a trombone, which slides up and down just, like your voice. Step 2: The next step in practicing vocal improvement exercises is by singing the lowest pitch that you can sing, with the use of vowel “ah“. After that, you can continue singing the high note again. When you sing the high note, try to slide down to that given low note. It may be common for you to stop halfway down, not being able to make it full to the lowest note. Just imagines that you are trying to imitate someone vocally in jumping from a high ground into the water. Usually, the sound that they emit is “ah“, and it begins from high note just like coming from top of the hill, sliding down smoothly until it hits the lowest note, just like reaching the surface of the sea. There’s no need to yell, but just utter continuously the lowest note “aah” in singing. This exercise can be done by “zipping up” your vocal chords to create a division in resonance between head and mouth. This mixed voice will help you sing high notes without cracking or yelling and improve your vocal range without losing depth of voice. The upper resonance is referred to as the head voice and this happens when the muscles vibrate at the frontal sinuses, somewhere at the spot between your eyes and bridge of your nose. This vibration should be felt at the soft palate or the roof of your mouth. However, remember this comes with practice and not overnight. So do not force your voice or strain it and sing lightly to get it right. Speech level singing exercise will strengthen the muscles at your throat or what we call the larynx or voice box. The muscles strengthens with exercise and helps to hold and control the voice due to stronger and better controlled vibration of the vocal chords. You will also be able to control the amount of air passing through your vocal chords allowing you to sing in richer and fuller voice. So, if you practice the above mentioned exercises you can surely learn how to increase your vocal range and hit high notes with ease and confidence. In practicing the vocal improvement exercises, you should be able to make your sound smoothly from the highest to the lowest point. It’s like the figure of a Christmas tree, which has a fat bottom going thin at the top. Get this form similar to your vocal shape. The highest note that you sing should be lighter and thinner, and as you sing, you should slide down continuously with your sound until it gets wider when you reach the lowest note. When you begin from the highest note, you should be able to feel it on top of your head and as you go along, the sound should become thinner, but not weaker. When you sing this particular note, you would often feel just like it’s flowing from the top of your head, instead of from your mouth. When you have slid smoothly from the highest to the lowest pitch, move a little higher and do it once more. One important thing that you should avoid in learning vocal improvement exercises is that you should never tense your jaw. 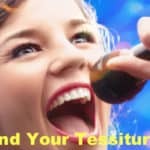 Begin sliding the tone as soon as you have gotten a kind of yawny breath. Even if you have started in rendering a male falsetto or a head voice, that’s not a problem. What you need to do is slide smoothly without committing big bumps. Keep in mind that doing these vocal range improvement exercises requires repetition; this is what makes them work. 1. Try not to consume dairy products. They are heavy on the stomach and also form a coating in your vocal chords. Both result in breathlessness while singing. 2. All singers are advised to take warm fluids like tea or warm water before singing and in frequent intervals during a performance since it prevents dryness of throat. 3. Do not be tempted to push a note, which you cannot sing. These results in voice cracking and the song will fall apart. It will also limit your vocal range. 4. Warm water with a teaspoon of honey and a dash of lime is good for your voice. Gargling with warm salt water helps in clearing your throat of phlegm and scratches. 5. Lastly, enjoy what you do. The more you enjoy your singing the more expressive it will be. Hope these singing vocal techniques will improve your vocal range dramatically. How To Find Your Tessitura Voice? What is Vocal Placement and How to Project Your Voice? How to Memorize Guitar Strings Easily?